How does the Monitor Station get internet access? With customer provided WiFi that has internet access. The RV Whisper® Monitor Station gets access to the internet by connecting to a WiFi network that has internet access. Many RVs have a dedicated mobile hotspot (sometimes called a MiFi or Jetpack) from their cell phone provider that is installed in their RV to provide reliable WiFi internet access. Section 1 of the Quick Start Guide explains how to add a new WiFi network to be used. Can I use campground WiFi for internet access? Most campgrounds WiFi networks can be used to get internet access. Section 1 of the Quick Start Guide shows how to configure different WiFi networks to be used. You can add multiple campground WiFi networks. Note that some campground WiFi networks require an additional browser login step (called “Captive Portal”) that requires acceptance of the WiFi terms of service that requires an extra step to configure. See FAQ for “Can I use WiFi networks with Captive Portals?” for instructions. Also note that some campground WiFi networks will disconnect devices after some number of hours and require manual re-connection and accepting the WiFi terms of service (See Captive Portal FAQ). Can I use WiFi networks with Captive Portals for internet access? Yes. Some WiFi networks use Captive Portal technology that displays a special web page in your phone browser after you connect to WiFi. The Captive Portal page usually requires you to accept the campgrounds WiFi Terms of Service and may require you to enter an additional coupon code or campsite number before your phone can connect to the internet. set your phone WiFi to connect to the RVM1-xxxx network using the “local WiFi password” printed on your monitor station label. temporarily disable cellular or mobile data on your phone. Your RV Whisper Monitor Station should now be connected to the campground WiFi network. Will the system automatically switch to different WiFi networks? Yes, once a WiFi network has been defined for the Monitor Station (see Section 1 of the Quick Start Guide), then the Monitor Station can automatically reconnect to that network. There is no limit to the number of WiFi networks that can be defined. The current WiFi network being used is displayed under Settings -> Network. It may take up to 5 minutes for the Monitor Station to switch to a different WiFi network. When I have no internet access, how do I view my RV Whisper® monitoring data when I’m near my RV? The RV Whisper® Monitor Station has its own “local WiFi” network, which nearby users can connect to in order to access their RV Whisper® sensor data. Once connected to the RV Whisper® local WiFi network, with a WiFi-enabled smartphone, tablet, or computer, the user displays the sensor data in a web browser – like Chrome or Firefox. To configure your tablet or phone to connect directly to your RV Whisper® Monitor Station local WiFi network, follow Steps 1 through 5 of Section 1 “WiFi Configuration Steps” in the RV Whisper® Quick Start Guide. All data are stored locally on the RV Whisper® Monitor Station installed in the RV – no internet access required. Note however, that email and text message alerts can not be sent when there is no WiFi internet access. Can I access my RV Whisper® data over the internet when away from my RV? Yes, the RV Whisper® Monitor System can be accessed over the internet when it is connected to a user-supplied WiFi network with internet access. How far away can the wireless sensors be from the RV Whisper® computer? It depends! RV Whisper® uses Bluetooth Low Energy (BLE) technology. The range is ~50 m in open air, but physical objects and walls can limit that range. Generally, we recommend installing the RV Whisper™ computer close to the sensors in your RV’s refrigerator and freezer. Get help with finding the best locations for your sensors! Your RV Whisper® unit automatically tracks the received signal strength (RSSI) for each sensor — an indicator of how well the computer can hear the signal from each sensor. If you want to improve the signal strength of your sensors, try out different sensor locations and use RV Whisper® to get feedback on how well a sensor location works in your RV. Track your RSSI data over time to see any changes in signal strength. Read more details in the Quick Start Guide or on the Support/Installation page. Will the wireless temperature sensors work at the cold temperature in my freezer? Yes. The RV Whisper® BTH1 wireless sensors are designed to operate at temperatures from to -40°C to +85°C (-40°F to +185°F) — well below recommended refrigerator (at or below 4°C [40°F]) and freezer temperatures (0°C [0°F]). How long will the batteries in my wireless sensors last? The BTH1 wireless temperature & humidity sensors use standard CR2032 coin cell batteries, which typically last for about one year and can be easily replaced by the user. Check the status of your sensor’s battery level — RV Whisper® automatically tracks and records the battery level for each of your wireless sensors over time. How do you keep my RV Whisper® data secure? Your RV’s data are only stored locally on your RV Whisper® computer — your RV sensor data are not uploaded to the Cloud. When you connect your RV Whisper® computer to strongly encrypted WiFi (WPA2), all web browser data between your RV Whisper® computer and your laptop or smartphone are encrypted in transit. Be careful when connecting your RV Whisper™ computer to insecure WiFi as it is possible for anyone to listen in on those communications. Our cloud-hosted services are optional and always use secure, encrypted connections between your RV Whisper® computer and our cloud infrastructure. The cloud services are only used to enable remote communication to or from the RV Whisper® computer using your local WiFi. None of the sensor data are stored in the cloud. The remote access service requires registration at our secure access website https://access.rvwhisper.com, where you can connect to your RV Whisper® from anywhere on the internet. The remote access service uses a secure, encrypted tunnel to connect directly to the web interface on your RV Whisper® computer. None of the sensor data are stored in the cloud. The remote service creates a simple and secure way for you to access your RV Whisper® from any internet connection. RV Whisper® Alerts are configured directly on your RV Whisper® computer, and the Alerts use a secure, encrypted tunnel to connect to our cloud messaging service to send you email alerts and text messages. What are the privacy practices for information collected by rvwhisper.com? How does Tank Whisper® work? Our patent pending Tank Whisper® technology can be thought of as an “active sonar system.” Whereas sonar uses sound waves to send information through water and listens for an echo response, Tank Whisper® emits low voltage electrical signals over wires and listens for the electrical response from the tank probe. By whispering small electronic signals to the tank probe system and carefully analyzing the response, Tank Whisper™ is able to determine the correct level of liquids in the tank. Even for black tanks that have displayed nothing but “FULL” for years. Our patent pending Tank Whisper™ technology integrates with the simple, low-cost tank monitoring probe systems that have been installed in most RVs over the past 30 years. Tank Whisper® enables RV owners to finally get correct tank level measurements. Our technology integrates a signal generator and custom signal analysis software with a built-in computer. Tank Whisper® plugs into the existing wiring to send more sophisticated signals to the existing tank probes. Will Tank Whisper® work in my RV? 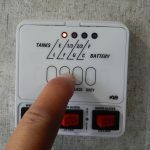 Have a tank level monitoring panel installed from KIB Electronics. Have a black tank that consistently reads “2/3” or “Full”, even when it’s empty. 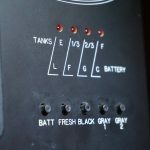 Is your RV’s tank monitoring panel from KIB Electronics? 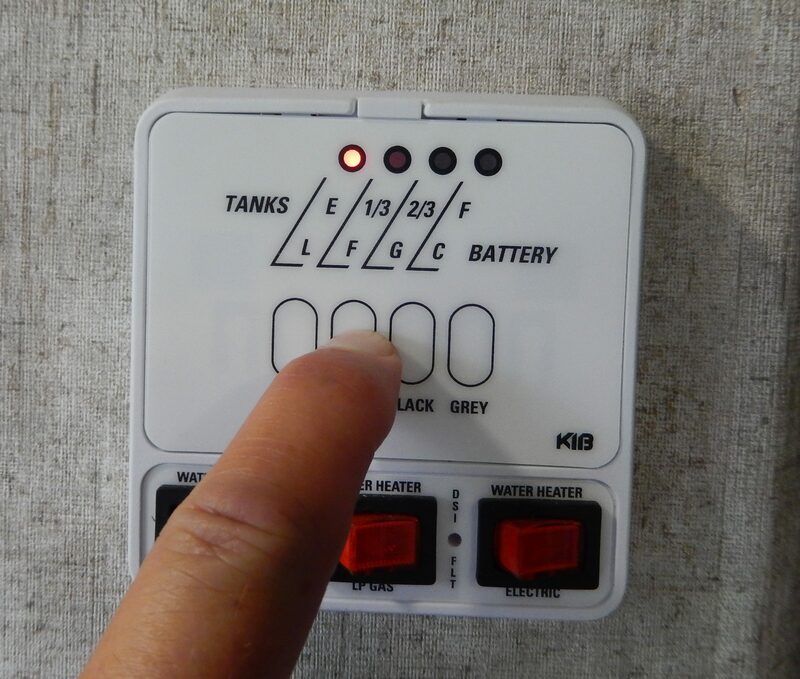 Tank Whisper® is designed to connect with the existing tank sensors, wires, and monitor panel from KIB Electronics – hardware that has been factory installed in most RVs for years. Not sure if you have a KIB monitoring panel? Has your black tank level read “Full” for years, even when the tank is empty? 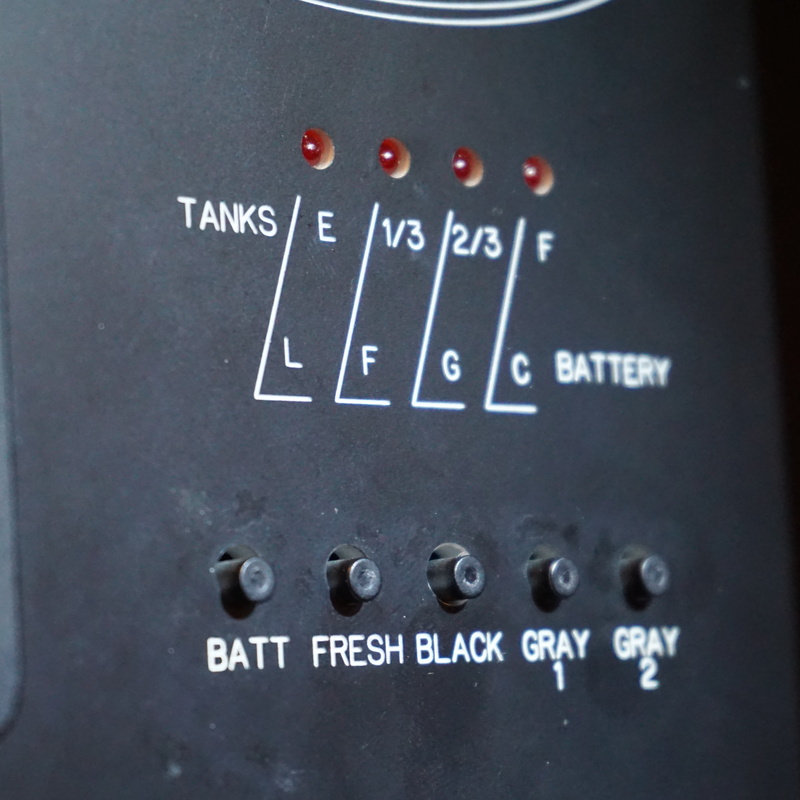 The most common issue with factory-installed tank level monitors is that they constantly display “2/3” or “F”, even after the tank has been emptied. Tank Whisper™ is designed to address this issue – our patent-pending technology determines the correct tank water level from functional factory-installed KIB hardware. Still uncertain if Tank Whisper™ is compatible with your RV? Please contact us and we will be glad to assist you! The wire harness for my tank is broken! How can I replace it before installing Tank Whisper™? The K101 harness is connected to the MP5 sensor probes that penetrate the tank wall. Each tank should have one sensor wire coming from the K101 harness, along with a ground wire.